Description: This module involves the use of the Kato double crossover. It involves a small scene of a main street of a country town sometime in the 50's or 60's. 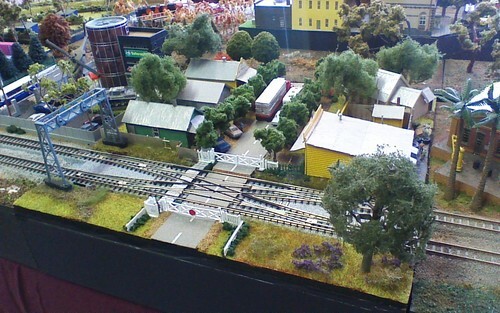 A small church is sited at the rear of the module, along with a selection of scratch built and kit based wooden shops and businesses. The road crossing cuts directly across the double crossover, it is controlled by a small set of traditional gates. These are a British set from Peco. At our recent exhibition we trialled the crossover with reverse wiring on the inside loop of our design. The digitrax system had no problem with the crossover in this configuration. I did adjust the wiring of the double crossover using the method suggested on this site by passing the wire connection from one end of the module to the other. It performs much better, particularly with short wheel based locos such as 060 or Bo-Bo's with 20-30ft centres. The double crossover is controlled by a digitrax stationary decoder with power taken from the rear main.